I am very happy for card makers to use my designs and Tutorials for there own personal use, I give permission to other teachers who have attended my classes to use my Tutorials. but would appreciate a credit to the design and instructions. please get in touch if you would like more information. It's been ages since I did a tutorial, and with Foamiran, been so popular, Here is a Tutorial for a rose and rose buds I designed. with Plaited Ribbon detail, and beautiful Foam Roses. 1. Stick the two 19cm Sq printed insert panels inside the card. 2. 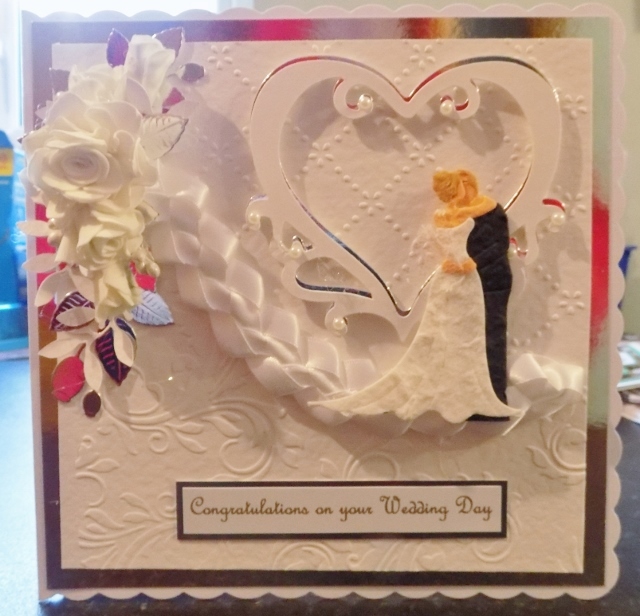 Embossed two 18cm Square white card panels with different embossing folders. 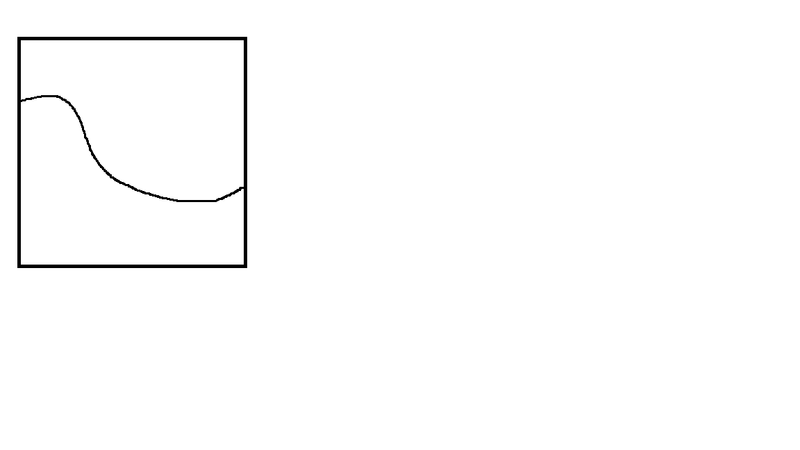 Put one on top of the other, and draw a wavy line from about 6cm top of left side to 8cm bottom right and cut through both embossed layers. And stick them to the 19cm Sq silver panel and stick to card front. 4. Stick the 2 die-cut hearts together silver at the back slightly peeking out. 5. 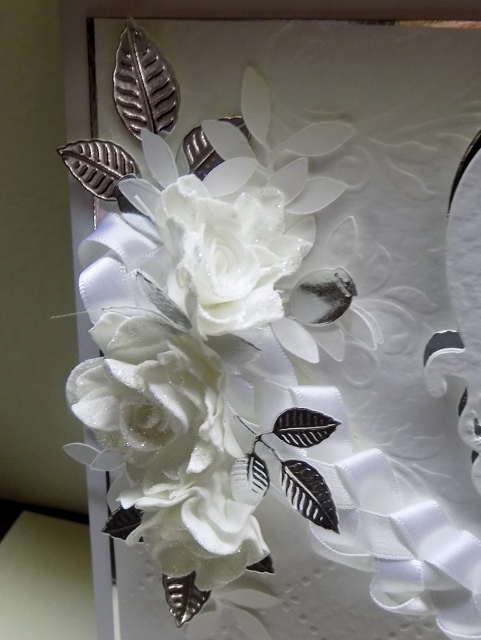 Mat and layer the greeting on to silver card. 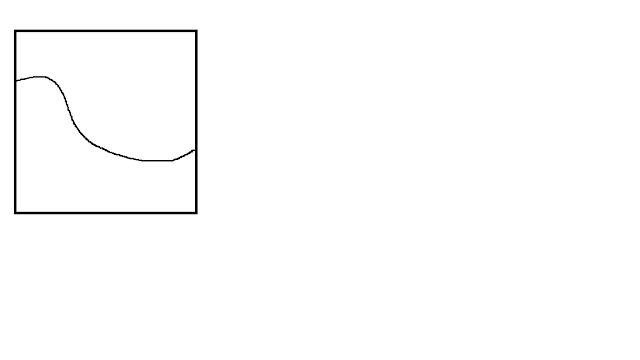 And stick it centrally to the bottom panel. 6. 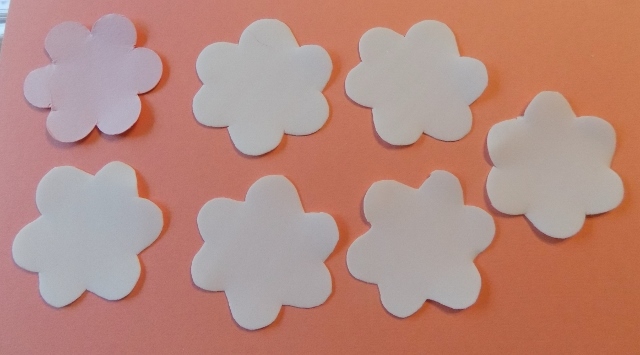 Arrange the leaves to the top left hand side of the card, hold some leaves back to tuck under the flowers. 7. Stick the tiny pearls to the heart swirls. 8. Stick the mulberry Bride and Groom to the lower right hand side of the heart. Raised on foam tape. This is my take on the foamiram product. 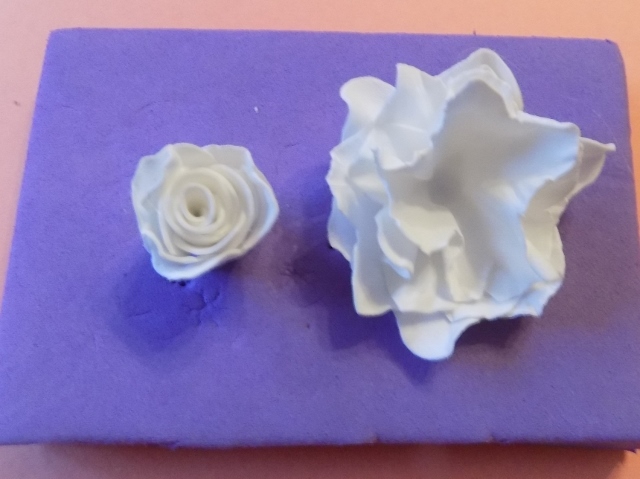 And as you will see, the foam works exactly the same as crepe paper or the non woven fabric, I have thought in the past. But with the foam you need to heat it slightly on a medium warm iron. Holding the foam against the heat with a long nose tweezers or wooden skewer. Hold foam against the heated iron for about 4/5 seconds. Let it fall away (or flick it away) and pick up immediately and gather the petals and twist into shape. 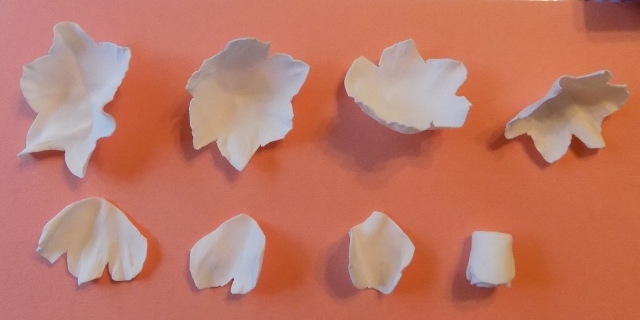 Depending on the flower you are making. Will decide how you will tease the twisted petals open. 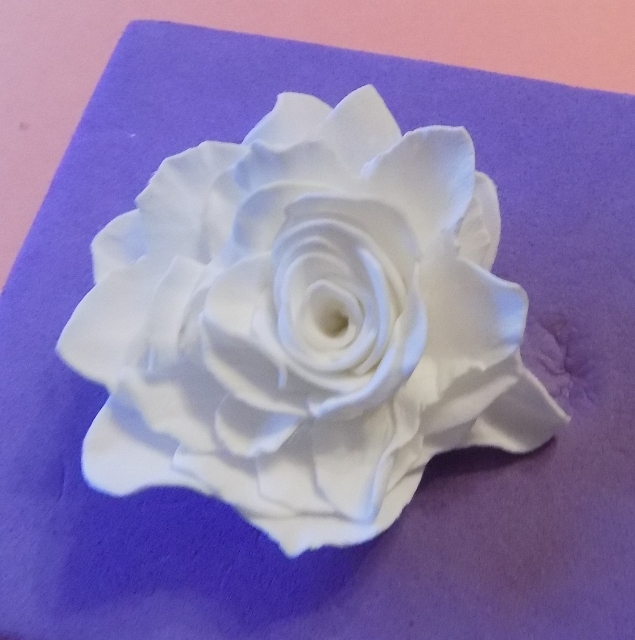 There are loads of video tutorials on youtube, and once you make the first few flowers, you’ll be hooked. Wish.com is the cheapest but take up to 60 days to arrive. Loads of printable ones available on pinterest. Foamiran does not punch well, as the punches tends to chew up the edges, but you can still heat the punched petals, and you really wouldn’t notice. I would punch your templates in card, then fold the strip of foamiran concertina style, as you can cut up to 6 layers with a sharp scissors. But experiment with stickles and other brands. 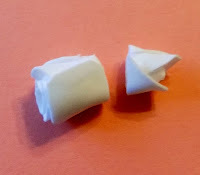 Wrap the 2nd single petal in the opposite direction. Heat the next 4 layers on the iron (1 at a time) and twist each layer tightly. Open each layer out, and slightly tease them open, take care as foamiran is delicate. 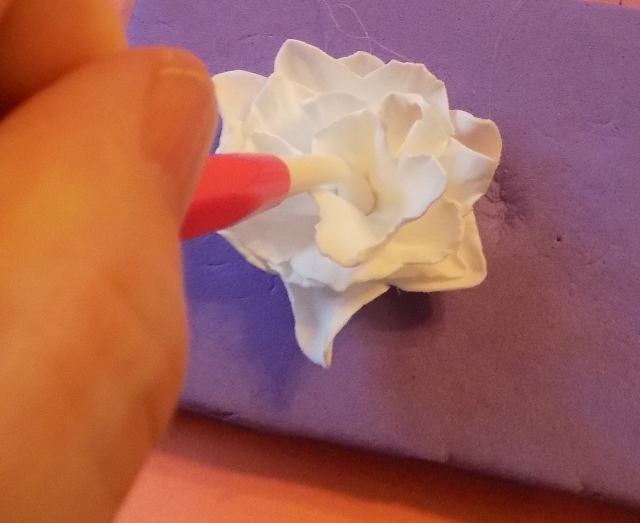 Don’t panic if the foam tears, you can still use the petals, but will need a bit more glue, you need to continue to wrap the layers until you are happy with the size of the center bud. Stick the 4 base layers together starting at the back, add a tiny drop of glue to the centre , and place 2nd layer on top, pressing the layers together in the centre with a plastic ball tool. ( a metal ball tool reacts with the heat and discolour the foam.) add the 3rd and 4th layer the same way. 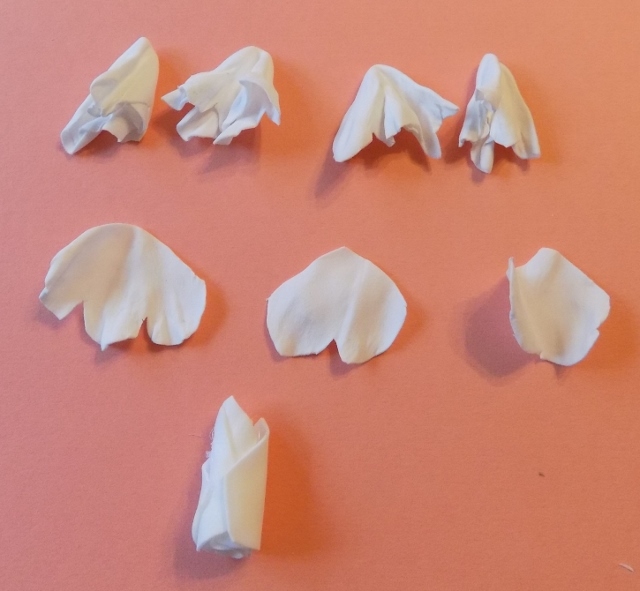 When you open out the twisted petals, you will see how different each one looks; choose the most open flattest one for the back. with the smallest looking one last. 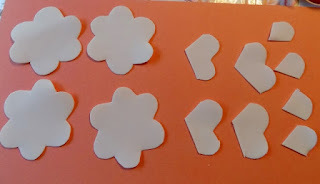 Lastly place the bud in the center with glue. and tease into shape. To make a tighter rose, continue adding layers to the bud, gluing as you go. If you need any help with inserts please ask. Thank you for stopping by, to view my tutorials. If you find my Tutorials useful, please be kind enough to leave a comment, and if there are any fancy folds you would like to see as a tutorial, I will do my best to add one for you.